Olmstead Point is one of those turnouts one doesn’t read much about in the literature; at least I hadn’t seen much about it. As we were driving along Tioga Road, we came across this vantage point and we were stunned by the amazing views. 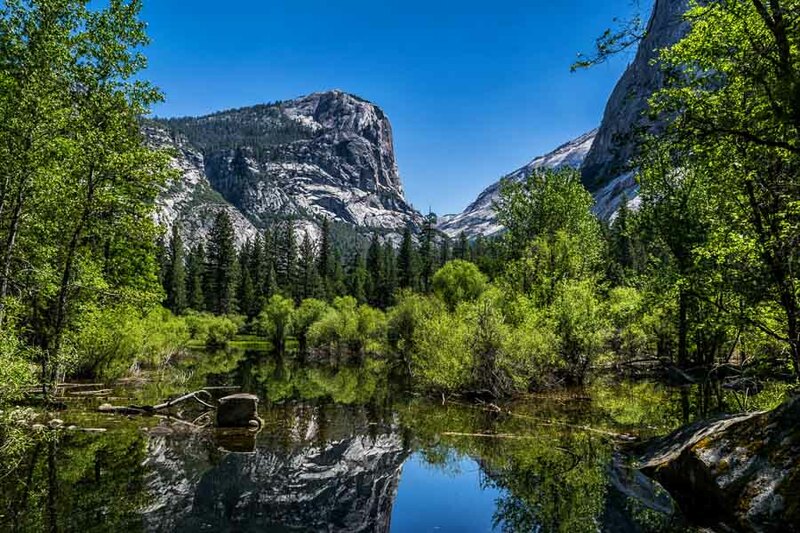 The picture of Half Dome above is one that is not generally seen as many of the viewing spots are located on the other side of this Yosemite notable. 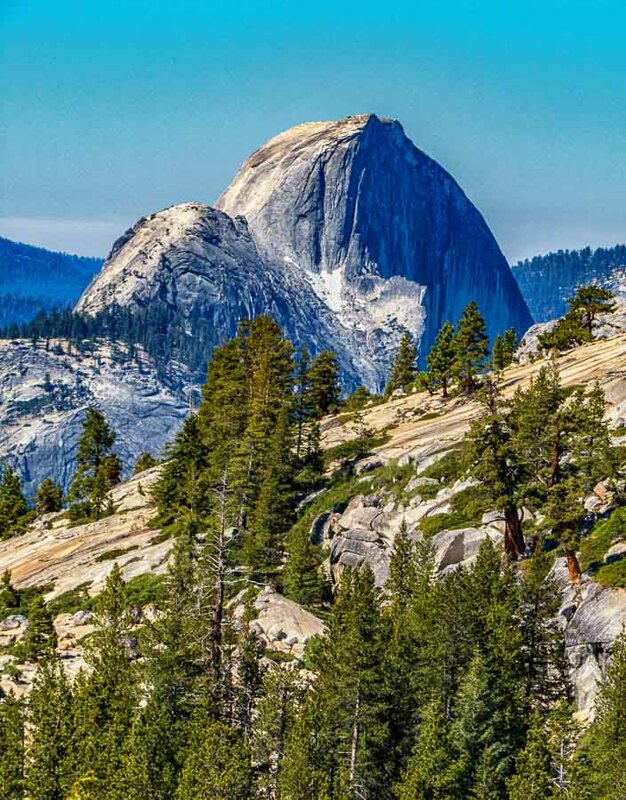 Olmstead Point is northeast of Half Dome and according to the map, approximately three miles away (+/-). The actual colors of the giant rock are not revealed well from this distance as the atmosphere lends a blue cast to the capture. There is at least one good hiking trail from this overlook (Olmsted Point trail) that we noted. Unfortunately,we did not take the earmarked hike, but now wish we had as it is remarked to be “one of the great values in scenery per square meter”. 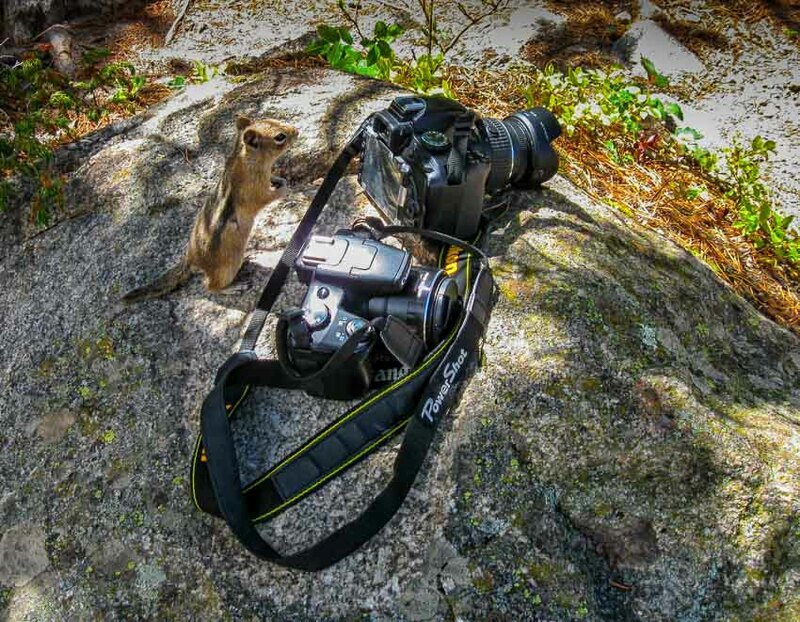 Even this chipmunk was interested in photography gear! On a recent hike, we sat down to have some lunch along the trail. It was apparent that the chipmunks were accustomed to people as this particular animal had no hesitation in “hanging around.” Just before we packed up to leave, he hopped on the boulder to examine my cameras. NOTE – We do not feed the wildlife in any of the places we hike, but this chipmunk had hopes! 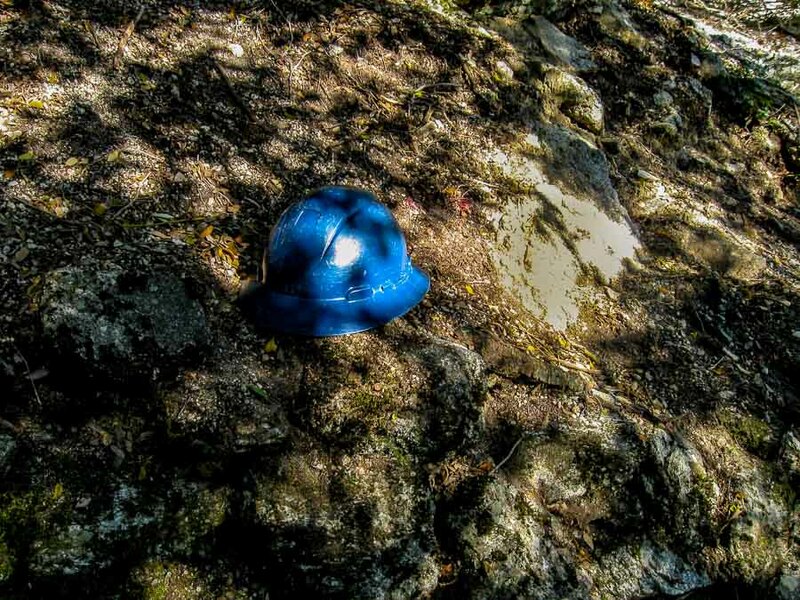 While hiking the Four Mile Trail we were surprised to find blue helmets in two different locations. One helmet was placed on a ledge of rocks and another was resting in the middle of the trail. 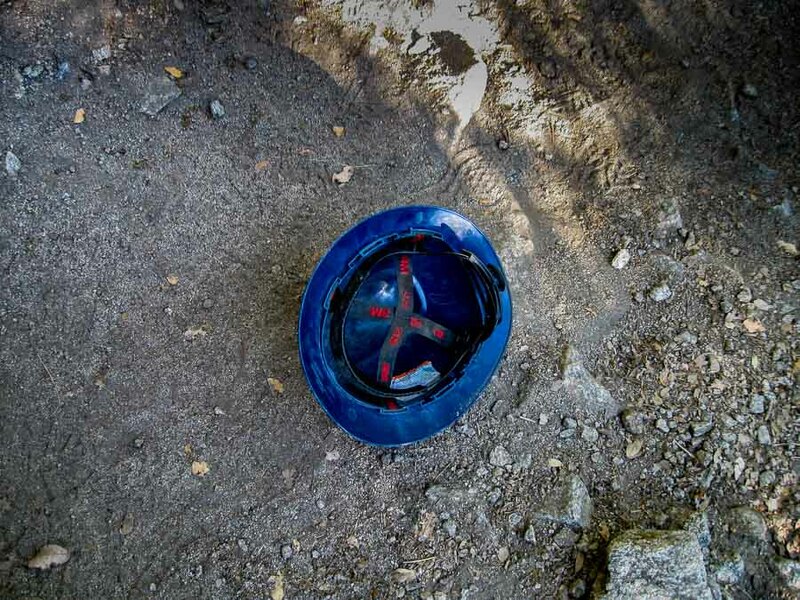 We made an assumption that these were probably protective gear used by rescuers. We previously showed a locked metal case placed along the edge of the trail in one spot which we likewise assumed had rescue gear inside (see YOY DAY 47). Other than the above conjectures, we don’t know what use these items might have in these particular locations. There was no rock climbing along this trail as far as we understood. 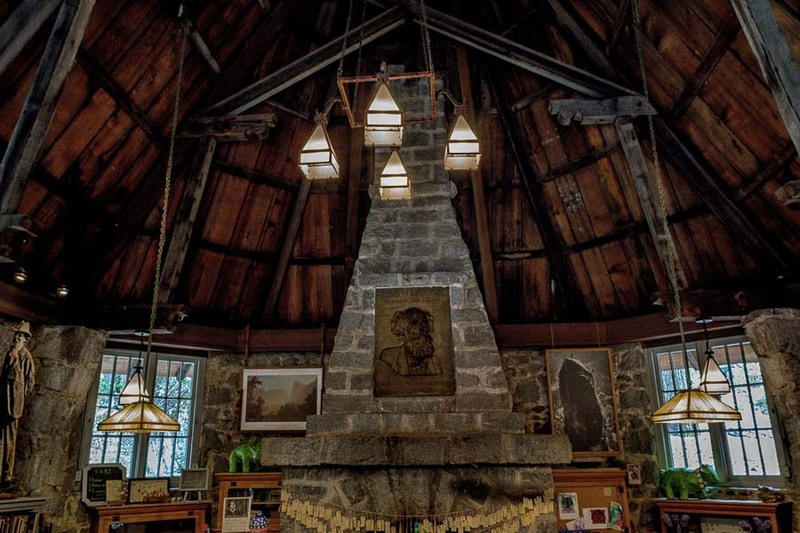 “The Yosemite Conservation Heritage Center (formerly LeConte Memorial Lodge), National Historic Landmark, was built by Sierra Club volunteers in 1903-04. Interestingly enough, as noted in an earlier post, the building had been moved. In speaking with volunteers, it was mentioned that the roof line does not fit as exact as desired so there are some gaps and appropriate accommodations that need to be made. To see a nice photograph of the beautiful stone building from the outside, see former YOY post HERE! Mirror Lake is a pretty lake although it is a bit cluttered with vegetation at times. This was one of the first major hikes we took and I did not realize that Half Dome was situated to the southeast. I “heard” that it is possible to get a reflection of Half Dome in the lake, but I did not know and therefore did not seek out that shot. It would have been a good one to attempt. I did manage to capture several images of North Dome which lies northwest of Mirror Lake. It would be a star in almost any other surrounding, but at Yosemite, it is forced to assume a supporting role.